The Envision109 project is temporarily on hold due to other interdependent infrastructure planning studies, such as the Centre LRT study, the Southside Core Neighbourhood Bicycle Network, and the ETS Bus Network Redesign. When the Southside Core Neighbourhood Bicycle Network was presented to Council’s Urban Planning Committee on August 14, 2018, a motion was passed that Administration provide further information on the feasibility of building separated cycling facilities or improving cycling connections to 109 Street. 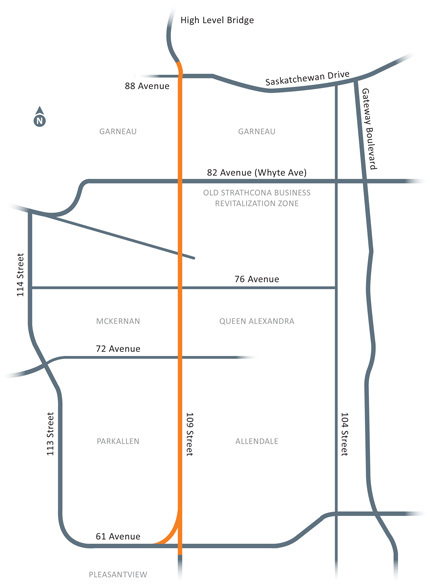 In response to that motion, Council Report CR_6322 Cycling Facilities and Cycling Connections: 109 Street will be presented to the Urban Planning Committee on April 23, 2019. Following the Council Report on April 23, 2019, the Envision109 project will continue developing 109 Street design vision and streetscape guidelines for short and long-term implementation. The design vision and guidelines will be presented to the public in fall 2019. 109 Street, between the High Level Bridge and 61 Avenue, is a major route linking downtown and south Edmonton. This street serves several residential neighbourhoods, schools, businesses and major transit routes. Planning studies have been carried out to revitalize the corridor over the past decade. The 109 Street Corridor Area Redevelopment Plan (ARP), approved in 2013, suggested that a Comprehensive Streetscape Improvement Plan (CSIP) be developed to review the function of the corridor, to improve the pedestrian environment and to help revitalize the adjacent areas. Streetscape improvements will be built in stages as funding is available. The City has begun a streetscape concept design study, Envision 109, to improve this busy stretch of public space. In the short-term, Envision 109 will propose streetscape improvements without major infrastructure changes. The project will also consider a major road redesign to implement in the long-term. This will occur when the road is due for renewal, or as directed by City Council. Public engagement is a key factor in the success of this project. We will encourage community engagement to spark discussion, to bring forward concerns and expectations. Public events and online opportunities will allow residents and businesses to provide their input. A Community Integrated Committee (CIC) was created of representatives of the Community Leagues along 109 Street, and the first CIC meeting was held on December 9, 2015 to introduce the project and collect initial ideas and concerns about 109 Street. Stay Informed - Receive email updates about the project as news becomes available. The Southside Core Neighbourhood Bicycle Network was presented to Council’s Urban Planning Committee on August 14, 2018 and Administration was asked to provide more information on the feasibility of building separated cycling facilities, or improving cycling connections to 109 Street. Following the completion of this analysis, Envision109 project will continue in early 2019 with a third round of public engagement focused on the streetscape design vision of the future 109 Street. A series of questions about Envision 109 was included in the City’s July 2016 Insight Community Mixed-Topic Survey. The Edmonton Insight Community is an online citizen panel made up of diverse Edmontonians who provide feedback on City policies, initiatives and issues. On Thursday, May 12, the project team presented major design considerations and guiding principles for the design of 109 Street streetscape. The purpose of this Open House was to help participants acquire a better understanding of the multitude of factors influencing this project. Public feedback will help the project team to come up with design solutions that address stakeholder expectations and city policies and directives in the best possible way, to ultimately improve the 109 Street corridor and help the revitalization efforts in the adjacent areas. On January 27, 2016, the City held an open house to encourage citizens to provide their feedback. The information received will assist in developing the guiding vision and a set of planning principles for the streetscape.